This long exposure image taken at Big Pit mining museum has not only blurred the clouds but also the turning pithead wheels. Big Pit is a former coal mining colliery near Blaenavon in Gwent, South Wales, United Kingdom. It was a working pit from 1860 to 1980. In 2001 it was taken over by the National Museum of Wales who undertook a redevelopment programme, reopening it as an industrial museum in 2004 and winning the prestigious Gulbekian Prize for Museum of the Year in the same year. Big Pit is a former coal mining colliery near Blaenavon in Gwent, South Wales, United Kingdom. It was a working pit from 1860 to 1980. In 2001 it was taken over by the National Museum of Wales who undertook a redevelopment programme, reopening it as an industrial museum in 2004 and winning the prestigious Gulbekian Prize for Museum of the Year in the same year. Mumbles Pier is an 835 feet (255 m) long Victorian pier built in 1898. It is located at the south-western corner of Swansea Bay near the village of Mumbles within the city and county of Swansea, Wales. The pier is used only for fishing and tourism, offering panoramic views of Swansea Bay with the Mumbles Lighthouse on one side and Port Talbot on the other. Halfway along the Pier on the Bay side is a Royal National Lifeboat Institution lifeboat station. Still housing the historical records of the local Mumbles lifeboat, the House also currently handles the 'Tyne' Class boat. In 2014 a new Tamer class lifeboat entered service at The Mumbles, and is now housed in a new, larger, boathouse with a slipway which were constructed at the end of the pier. Limeslade Bay is a small cove just to the west of Bracelet Bay in the south east corner of the Gower Peninsula, near Swansea in south Wales. It is a sheltered, mainly rocky beach with little sand. Bathing is possible. From Limeslade Bay there is a cliff walk to Langland Bay, about half a mile to the west. Swansea's Big Apple is believed to be the last remaining kiosk of several built by a cider company in the 1930's to promote their products. Situated on the hill between Mumbles Pier and Bracelet Bay the kiosk now serves ice cream, refreshments and souvenirs to tourists and is probably one of Swansea's best known landmarks. In 2009 it was badly damaged when a car ran into it but it was rebuilt and reopened in 2010. Arriving at the pier this morning I was disappointed as the weather was misty, However after about an hour the mist lifted and I managed to capture this scene. Penarth Pier lies just a few miles west of Cardiff in the beautiful Vale of Glamorgan in South Wales and is the jewel of the crown of this seaside resort. It is situated on the Bristol Channel which has the second highest tidal range in the world. It has been a hugely popular destination for holidaymakers and day trippers since Victorian times and is known as The Garden by the Sea. A picture postcard day at Roath Park in Cardiff. I spent many days fishing on the banks of the lake in my youth and this place holds many memories for me. The park was built on 130 acres of land which was donated to the city in 1887, primarily by the Marquis of Bute. A lighthouse was constructed in the lake containing a scale model of the 'Terra Nova' ship to commemorate Captain Scott's ill-fated voyage to the Antarctic from Cardiff in 1910. The Scott Memorial Lighthouse stands in Roath Park Lake in Cardiff, Wales, United Kingdom. The lighthouse was erected in 1915 in memory of Captain Robert Falcon Scott and his companions who died whilst trying to reach the South Pole in 1912. Hayes Island Snack Bar is a popular snack bar situated on the Hayes in Cardiff city centre. A two minute exposure over Whitmore Bay, Barry Island, Barry in Wales, United Kingdom. The Water Bus stop at Bute Park in Cardiff. The Maritime Memorial is a sculpture situated on the waterfront outside the Welsh Assembly Government building (Y Senedd) in Cardiff Bay. It is fashioned out of metal in the shape of the bow of a boat. The Principality Stadium, formerly known as The Millennium Stadium (Welsh: Stadiwm y Mileniwm) is the national stadium of Wales, located in the capital city, Cardiff. It is the home of the Wales national rugby union team and has also staged games of the Wales national football team. Initially built to host the 1999 Rugby World Cup, it has gone on to host many other large-scale events. Castle Arcade is a Victorian shopping arcade and one of several historic shopping arcades in Cardiff city centre. Started in 1887 it is now home to a variety of small boutique shops including cafes and delicatessens. Together with Cardiff Market they are the only two level shopping arcades in Cadiff. There are also several shops on the upper gallery level. Castle Arcade was Grade II listed in 1975. The inscription reads - Within Thes Stones Horizons Sing and a Welsh inscription - Creu Gwir fel gwydr o ffwrnais awen, which means Creating truth like glass from the furnace of inspiration. Wales Millennium Centre (Welsh: Canolfan Mileniwm Cymru) is an arts centre located in the Cardiff Bay area of Cardiff, Wales, United Kingdom. A wonderful autumn sky over Dare Valley Country Park in Aberdare. A heavy sea fog envelops Penarth Pier. Penarth Pier lies just a few miles west of Cardiff in the beautiful Vale of Glamorgan in South Wales and is the jewel of the crown of this seaside resort. It is situated on the Bristol Channel which has the second highest tidal range in the world. It has been a hugely popular destination for holidaymakers and day trippers since Victorian times and is known as The Garden by the Sea. Langland Bay is a popular seaside holiday resort in Gower, Swansea in south Wales. In the right conditions, it is one of the best surf beaches in Britain. The statue of Tommy Cooper which stands in his birthplace town of Caerphilly in South Wales. Overlooking the Welsh Valleys village of Six Bells and standing 20 metres tall The Guardian is a monument created to commemorate the mining disaster at Six Bells Colliery on 28 June 1960 killing 45 of the 48 miners working on the in the West District of the Old Coal Seam. The cause was an explosion from the ignition of firedamp. Designed and created by artist Sebastien Boyesen and built for the 50th anniversaty of the disaster in 2010. Pleasure craft in the marina at Cardiff Bay. Cardiff Bay played a major part in the development and success of Cardiff as an exporter of coal to power the industrial age. 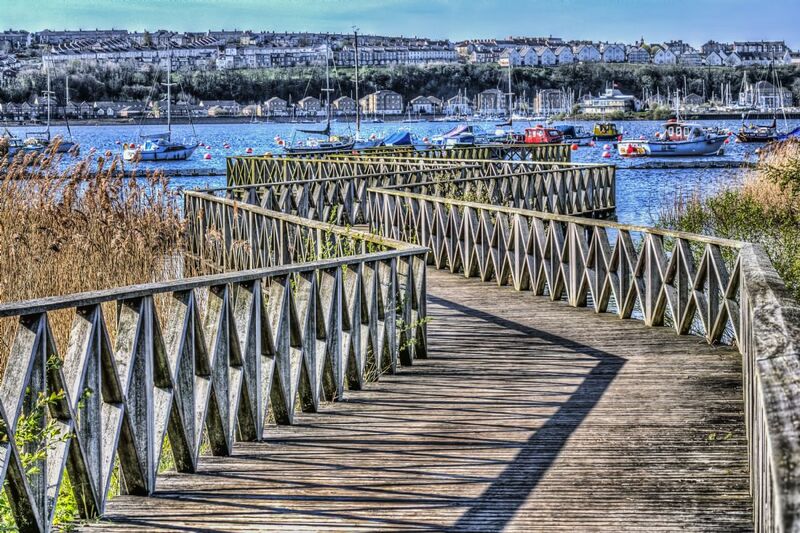 Tiger Bay is historically one of the first multicultural ports in Great Britain and the community comes from up to 45 different nationalities. The docks were regenerated in 1999 by the creation of the Cardiff Bay Barrage. The view over Cardiff Bay from in front of Y Senedd. Cardiff Bay played a major part in the development and success of Cardiff as an exporter of coal to power the industrial age. Tiger Bay is historically one of the first multicultural ports in Great Britain and the community comes from up to 45 different nationalities. The docks were regenerated in 1999 by the creation of the Cardiff Bay Barrage. A view looking back towards Cardiff Bay. Cardiff Bay played a major part in the development and success of Cardiff as an exporter of coal to power the industrial age. Tiger Bay is historically one of the first multicultural ports in Great Britain and the community comes from up to 45 different nationalities. The docks were regenerated in 1999 by the creation of the Cardiff Bay Barrage. The inscription reads - Within These Stones Horizons Sing and a Welsh inscription - Creu Gwir fel gwydr o ffwrnais awen, which means Creating truth like glass from the furnace of inspiration. Wales Millennium Centre (Welsh: Canolfan Mileniwm Cymru) is an arts centre located in the Cardiff Bay area of Cardiff, Wales, United Kingdom. Phase 1 of the building was opened in 2004 and phase 2 opened in 2009. The centre has hosted performances of opera, ballet, dance, comedy and musicals. This is the water tower situated in Roald Dahl Plass (The Oval Basin) in Cardiff Bay, Cardiff, Wales. Standing 21 metres high it was designed by William Pye, is constructed of stainless steel and is covered in a continuous flow of rollwaving water. This statue of Mahatma Gandhi was unveiled in October 2017 following three years of fundraising by the Hindu Council of Wales. Mahatma Gandhi was an Indian activist and politician who led the Indian Independence movement against British rule. In 1910 the British Antarctic Expedition, led by Captain Robert Falcon Scott, departed from Cardiff Bay in the vessel SS Terra Nova but the expedition ended tragically and never returned. Erected as part of an outdoor exhibition in Cardiff Bay to celebrate the centenary by the Captain Scott Society, the barrage sails form a striking sculpture. 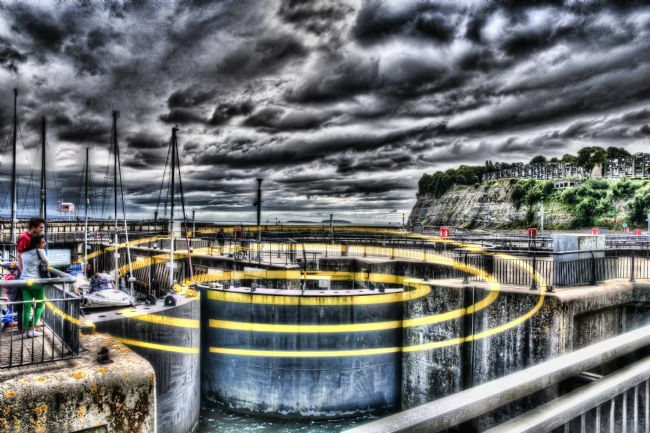 These concentric circles are called The Three Ellipses For Three Locks and are public street art at the barrage at Cardiff Bay, Cardiff, Wales in the United Kingdom and were designed by the Swiss born artist Felice Varini. The circles can only be seen joined up from one spot. This bronze sculpture of a Gloucester Old Spot Pig was sculpted by Sebastian Boyesen and stands opposite an entrance to the market in Newport, Gwent. Designed to celebrate 700 years of markets in Newport it was unveiled in 1994. Overlooking the Welsh Valleys village of Six Bells and standing 20 metres tall The Guardian is a monument created to commemorate the mining disaster at Six Bells Colliery on 28 June 1960 killing 45 of the 48 miners working on the in the West District of the Old Coal Seam. Penyfan Pond is a canal feeder reservoir situated near Blackwood in Gwent. Barry Island (Welsh: Ynys y Barri) is a district, peninsula and seaside resort, forming part of the town of Barry in the Vale of Glamorgan, South Wales. It is named after the 6th century Saint Baruc. Barry's stretch of coast, on the Bristol Channel, has the world's second highest tidal range of 15 metres (49 ft), second only to Bay of Fundy in Eastern Canada. The peninsula was an island until the 1880s when it was linked to the mainland as the town of Barry expanded. Rhoose Point (Welsh: Trwyn y Rhws) is the most southerly settlement of mainland Wales. It stands on the Wales Coastal Path a few miles west of Cardiff. An early morning walk around Bargoed saw a glorious sunrise and, as I headed north this wonderful autumn view over towards Brithdir met me. This image has been given an oil painting effect. An early morning walk around Bargoed saw a glorious sunrise and, as I headed north this wonderful autumn view over towards Brithdir met me. The Brecon Beacons Trinity is an image of Penyfan, Corn Ddu and Cribyn taken from St Sannans churchyard in Bedwellty, some 7 miles away as the crow flies. Penyfan stands in the Brecon Beacons National Park and is the highest peak in South Wales at 886 metres above sea-level. A three and a half minute exposure at Melincourt Falls smooths out the water. Melincourt Falls is a spectacular 80 feet high waterfall on Melin Court Brook, a tributary of the Neath River, located near Resolven in South Wales. It is formed where the brook plunges over a resistant band of 'Lower Pennant Sandstone' The falls are considered by some to constitute a part of Waterfall Country though the bulk of these falls are a few miles further northeast at the head of the Vale of Neath. It is a very popular tourist spot. Melincourt Falls is a spectacular 80 feet high waterfall on Melin Court Brook, a tributary of the Neath River, located near Resolven in South Wales. It is formed where the brook plunges over a resistant band of 'Lower Pennant Sandstone' The falls are considered by some to constitute a part of Waterfall Country though the bulk of these falls are a few miles further northeast at the head of the Vale of Neath. It is a very popular tourist spot. A cyclist takes a break in his journey. This image, taken in the Cardiff Bay Wetlands area has been given a finger painting treatment. Chartist Man is a 26 foot tall statue standing at the end of the Chartist Bridge in Blackwood, Gwent. Built by Sebastien Boyesen the sculpture is made from thousands of steel rings creating a mesh like figure and symbolises the Chartist principle of binding together and strength in unity. In 1839, 22 chartists lost their lives protesting for basic rights outside the Westgate Hotel in Newport and this figure represents a protester striding towards Newport.